Grand Father Elishia Jack Wright was born in january of 1892 along a stretch of road known as the Devils promanade located between Oklahoma and Joplin Missouri,he would tell tells of the light , It has gone by many names as it has made it's appearances here in a place called the "Devil's Promenade", but it's most commonly known as the Hornet Spook Light. The Spooklight, also called the Hornet Spooklight, is a mysterious visual phenomenon allegedly experienced by witnesses in a small area known locally as the "Devil's Promenade" on the border between southwestern Missouri and northeastern Oklahoma west of the small town of Hornet, Missouri. 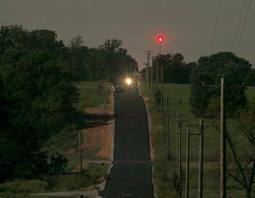 Despite the fact that it is named after a small, unincorporated community in Missouri from which it is most commonly accessed, the light is most commonly described as being visible from inside the Oklahoma border looking to the west. The Spooklight is commonly described as a single ball of light or a tight grouping of lights that is said to appear in the area regularly, usually at night. Although the description of the light is similar to that of other visual phenomena witnessed throughout the world, the term "Spooklight" when standing alone generally refers to this specific case. Numerous legends exist that attempt to describe the origin of the Spooklight, one of which involves the ghosts of two young Native American lovers looking for each other. According to most accounts, it has appeared continually since the late 19th Century, although it was generally not well known to anyone but locals until after World War II. Some date the first encounters with the light back to the Trail of Tears in the 1830s. However, the first documented sighting is generally accepted to have occurred in 1881, although some report sightings as far back as 1866.